My bentos have been pretty boring the last weeks. Maybe I just spend too much time reading and then there's no time left for decorating. Maybe I should plan my bentos beforehand and not decide most of it in the morning. This isn't a charaben, but at least, it has a face. And there's nothing from the freezer in it. 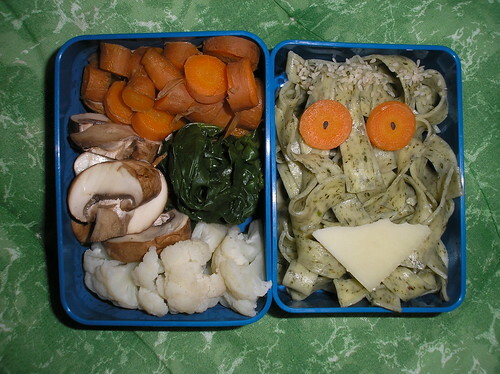 The bottom tier has carrots, mushrooms, spinach and cauliflower, the top tier has ramson noodles, carrot eyes with black sesame pupils, sesame hair and a cheese mouth.